It’s no secret that most child-abuse survivors wrestle with lifelong emotional-and-physical issues, but I look at “The Lighter Side” of life this way: Either I rehash the abuse I went through and stagnate in the cesspool my abusers created, or I move forward and enjoy the time I have left on earth. Years ago, I gave up drinking and smoking. I never took illegal drugs so that wasn’t a concern of mine, yet I can truly understand how people can get hooked on substances since all of us are always looking for our great escape from traumatic, physical-and-psychological issues. The only major debacle in my life now is food; I am addicted to it though I haven’t grown to enormous proportions yet…ahem. When my main abuser died (my mother) in 1993, sad to say I breathed a sigh of relief though many in my family to this day chastise me for feeling that way. My father, who was my mother’s enabler in torturing me, was just as sadistic as she was. He died a few years later. I now refer to my mother and father by using their first names since they both lost the right to be called mother and father when they made a conscious choice to delight in savagely abusing me from the time I was born. At any rate, on a lighter note, I found my great escape from child abuse at the age of three with the written word when I taught myself how to read and write. As years progressed, writing and photography became essentials and I made it a point to always travel with my best friend; a camera. 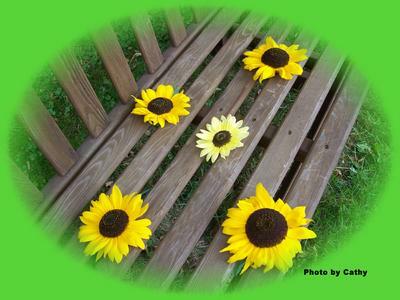 A few years ago, I developed a keen interest in sunflowers. 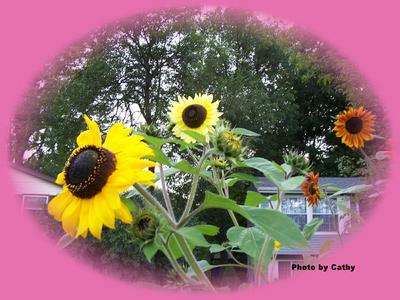 In 2006, teeny sunflower seedlings were planted in my front yard and, as you can see, grew to the height of the sun. Make your life work for you rather than the other way around; enjoy what nature has to offer. View colorful leaves in Fall as you take a visual tour of thick defined clouds hovering in a pastel-blue sky. Hear the crunch of the leaves, and bend down so you can pick up those leaves with your hands. Get in tune with your emotions. Make a snow fort in Winter like you did when you were a kid, breath the aroma of fresh daffodils in Spring, and hone the lull of a waterfall in Summer…all yours for the asking.